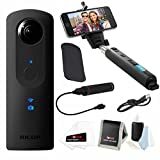 Ricoh Theta S, a new 360-degree camera, is one of the best gadgets to have. It is great fun to play with when you are in a perfect lit scene. It has twin fisheye lenses, each with its own image sensor this can capture complete 360 degrees spherical panorama shots in a single shot. Ricoh Theta S has two 12MP 1/2.3″ sensors. The S is capable of 14MP 360-degree still images, which is an improvement over the earlier version. Brighter F2.0 lenses, 1080/30p video, and integration with Google’s new Street View app are all on board. It offers the chance to take me right back to the moment of capture like no other camera. You can experience the excitement of capturing images that go beyond ordinary photography. The Theta S doubled the capacity of the built-in memory from 4GB to 8GB, you can capture more high-res video and images before the camera is full. The manufacturers say that they improved battery performance, but that should be tested. They increased video recording time to 25 minutes. You can get 1920 x 1080 frame shots. It also has a zooming effect. Ricoh Thera S sports a pretty simple design, with 3 buttons on the side. One for power, other for Wi-Fi, and the last one to select mode. Theta S is also revamped with enhanced sharing capabilities to wirelessly share both movies and photos to a mobile device for posting online using built-in Wi-Fi. It means you can transfer videos directly to your mobile device without ever needing a computer. Spherical images can be posted to social networking services from the app and shared easily with friends. There are also indicators on the front of the camera to show whether it is in still mode or video mode, Wi-Fi tethered or still connecting, whether it is currently recording, and if you’re running out of memory. You can edit the video too. You can add modifications like adding text. The cool part is, there are several white balance modes, which include Auto, Outdoor, Shade, Cloudy, Incandescent light 1, Incandescent light 2, Natural white fluorescent light, fluorescent light, and Lightbulb color fluorescent light. The major con of this Ricoh Theta S is not waterproof. It doesn’t have a self-timer and it stops itself when it gets overheated. One might say it is a good thing that it doesn’t damage itself by overheating, but we think it should not over heat, to make it unassailable.